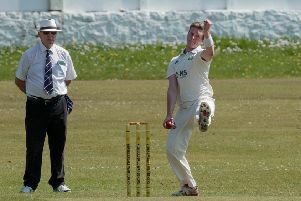 Ribblesdale Wanderers suffered a four-wicket defeat at the hands of Brinscall on Saturday. Brinscall won the toss and elected to field at Church Meadow, and bowled the hosts out for 104, as Lee Burgess took 7-45 off 15 overs. Mack Spencer was unbeaten on 37, while David Steinson added 26. In reply, Brinscall got home with four wickets in hand, former skipper Liam Winstanley opening and leading them home with 49 not out. The previous night, at Settle in the 20/20 competition, Wanderers won on the toss of a coin. The winners of tomorrow night’s derby between Ribbesdale Wanderers and Whalley will qualify for the quarter-finals.